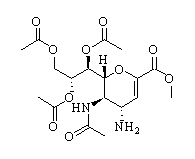 Baloxavir is an anti-influenza agent extracted from patent WO 2017104691 A1. Laninamivir is an antiviral agent. Dehydroandrographolide is extracted from herbal medicine Andrographis paniculata (Burm f) Nees; alleviate oxidative stress in LPS-induced acute lung injury possibly by inactivating iNOS. Amantadine is a weak antagonist of the NMDA-type glutamate receptor, increases dopamine release, and blocks dopamine reuptake. Amantadine probably does not inhibit MAO enzyme. Amantadine Hydrochloride is an antiviral and an antiparkinsonian drug. Peramivir Trihydrate is a trihydrate of the anti-infection agent Peramivir Trihydrate which is a transition-state analogue and a potent, specific influenza viral neuraminidase inhibitor with an IC50 of median 0.09 nM.The IC50 for Peramivir Trihydrate is markedly lower than that for either zanamivir or oseltamivir. Peramivir is an experimental antiviral drug developed by BioCryst Pharmaceuticals for the treatment of influenza. Theaflavin is a suitable natural inhibitor against influenza A (H1N1) neuraminidase. Nucleozin targets influenza A nucleoprotein (NP), a multifunctional, RNA-binding protein necessary for virus replication. Zanamivir Amine Triacetate Methyl Ester is a synthetic precursor of Zanamivir which is used as an antiviral agent against the influenza virus.